- Transit time are specified in business days. For example, a UPS 2nd. day order shipped on Friday, will arrive Tuesday. - For special order products, such as HID cards and readers, please add the lead time to the shipping transit time. For International orders, USPS Express Mail International takes 3-5 days to arrive. All intermational shippings are insured. 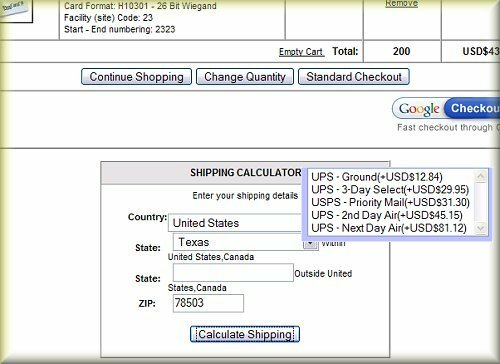 If you need to know shipping charges before registering or placing an order, our shipping calculator provides real-time freight costs to buyers all over the world.